If you’re a child of the 80’s you’ll definitely recall that magical time from your youth that involved being the first person in the house to wake up and commandeering the most coveted spot on the couch to watch Saturday morning cartoons. Listen to the podcast here or read on below. It’s a place in time and a feeling that most of us would look back on fondly, great memories, and great content that captured our imagination. I think Director James Gunn knows that feeling, and successfully manages to takes us all back to that place with Guardians of the Galaxy Volume 2. In past reviews I’ve accused films with little practical effects as soulless, and (in spite of my love for comics) most comic book films as a mediocre excuse to print money these days. Guardians seems to be the exception to that rule. And let’s hope that the people at Marvel studios have taken noticed (judging by the Thor Ragnarok trailer I think they may have). In short, if you liked the first Guardians of the Galaxy Movie, you’ll love this one just as much. The story goes that after saving the Galaxy in the first film the Guardians are now heroes and working as mercenaries for Xandar. 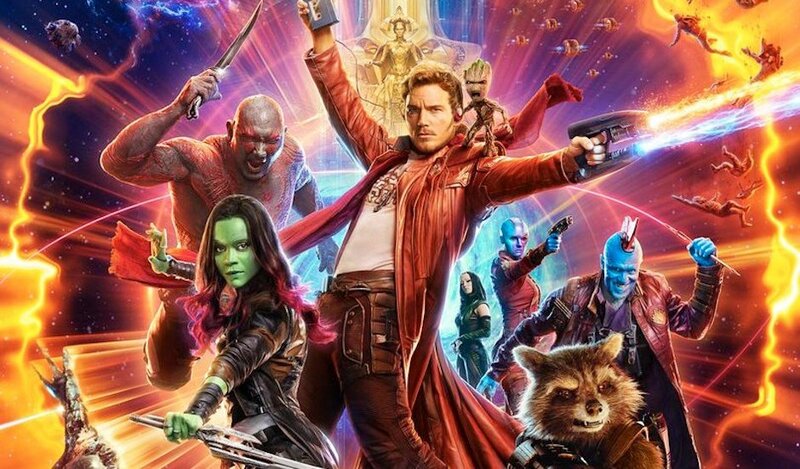 The movie drops you straight into it with, Star Lord, Drax, Rocket Racoon, Gamora and Baby Groot in a huge battle against an interdimensional monster, which is loads of fun! They bumble their way through the battle, deliver on their contract but cheat their employers out of some anulax batteries, thus sparking off a chase, a crash landing and a meeting with a mysterious stranger, Kurt Russell’s ‘Ego’ that holds the answers to who Star Lord’s not so human parent may be. The thing that this movie gets so right is the cast and characters, there’s so many crammed into this film and each of them gets enough time to breathe in the two and a bit hours that it never seems over the top and one never really seems to eclipse the other. and Vin Diesel’s baby Groot, to ramp up the cute factor. There’s a chemistry between the characters that makes you think they are the family that they all so desperately wanted to be a part of in the first movie. You kind of feel like you’ve been invited over for dinner watching them bicker and do all that normal family stuff throughout the meal. Kurt Russell is great as Ego but for me my favourite character is the leader of the outlaw Ravagers, Michael Rooker as Yondu. Rooker is such an accomplished actor, he’s done it all, Cliffhanger with Stallone (who happens to make a small cameo appearance in this movie), Henry from Henry Portrait of Serial Killer, Rowdy Burns in Days of Thunder, Frank Dailey in Mississippi Burning, Merle Dixon in the Walking Dead. His resume is huge, and yet I think throughout his career, with the exception of Henry, he’s always been on the undercard playing second fiddle to whatever leading man or woman he’s been cast to support. Make no mistake, he’s a supporting actor here too but for me, he absolutely steals the show with Yondu. His delivery is brilliant, with every line that comes out of his mouth as the blue alien with the southern drawl, he brings comedy, fear, authority and emotion with perfection and does not miss any of the cues. For me this is a tipping point for Rooker who has played so many great roles throughout my entire lifetime of watching movies, Yondu is my all-time favourite. If you want to laugh, if you want to be thrilled, if you want to cry, if you want to sit around down for a couple of hours and be reminded of how it felt to let your imagination run away with you while watching Saturday morning cartoons, see it. Guardians of the Galaxy Volume 2 gets four and a half out of five.